Do you need extra help for EL students? Try the Exploring Number Forms pre-lesson. Students will be able to add two-digit numbers using expanded form and a number line. Invite two student volunteers to go head to head and answer a place value question. Explain to the students that whoever answers the question correctly first stays standing and faces another student for the next question. Provide encouragement to students who answer the questions wrong by giving out high fives. Focus on past knowledge questions relating to identifying place values. Examples: "Tell me the value of 3 in 93 (3 ones). 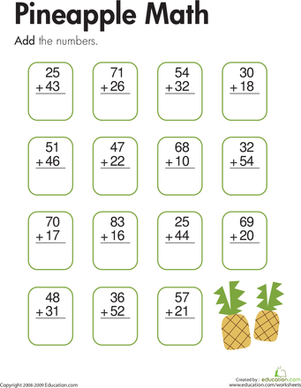 What number is in the tens place in 49 (4)? For 37, which number is greater, the digit in the tens place or the digit in the ones place (tens place)?" Say, “All those questions focused on place value. Now we will use our understanding of place value to add using a number line." Allow students to work in partnerships with a sympathetic non-EL student or alongside a peer who speaks the same home language (L1). Provide students with a few place value questions and encourage them to work together to solve the problems. Have students turn and talk to an elbow partner, explaining what the word place value means in their own words. Allow students to explain why a problem was wrong, using sentence frames to support their ideas, such as: "The answer was wrong because ____." Read the learning objective to the class. Provide examples of expanded form, which is when we expand the number to show the value of each digit (eg. 56 = 50 + 6). Give students an example of a number line, which is a line that has marked intervals. This is a tool we can use to perform operations in a visual way. 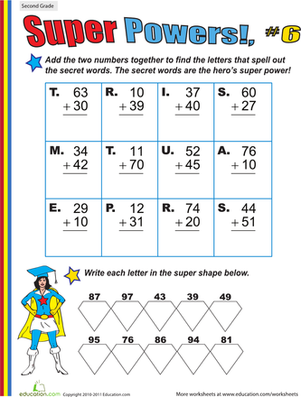 Remind students that two-digit numbers are numbers that have a whole number in the ones and tens place. Introduce the Add on Number Line Checklist that you have displayed, and discuss the elements with the students (talk over what strategies are used and highlight the key words). 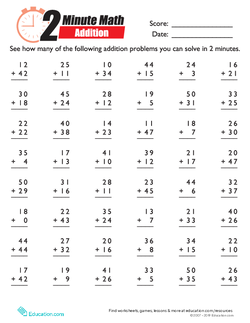 Provide a sample problem (80 + 13) and check off each step as you complete it. Model two more problems (75 + 23 and 89 + 10). Ask students to copy your work on their whiteboards as you complete the problems. Break down the learning objective into student-friendly language. Define difficult words in the learning objective in English and students' L1. Provide students with notecards for important vocabulary from the lesson. Include definitions and corresponding visuals on the back of each notecard. Encourage students to paraphrase the meaning of each important vocabulary word after you explain them. Invite students to come up to the front of the classroom to "show what they know" to the rest of the class, if appropriate. Encourage students to detail their process. 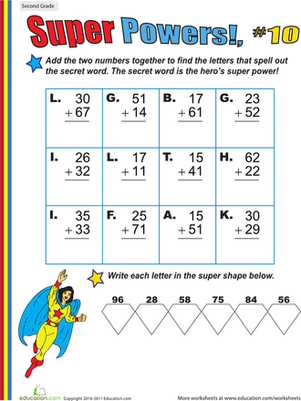 Distribute some of the cards to each pair of students, and have them draw their own two-digit numbers. 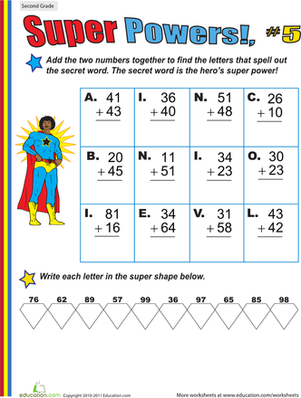 Instruct students by saying, “Okay, now you will draw your own digits and use the Add on Number Line Checklist to guide you as you solve two problems with your partner." Request that at least two students share their answer and their process. Have the students "take a stand" for the answers after each student has shared their problems and answers. The students will stand if they agree the problem is correct and sit if they think it is wrong. Choose a student that says the problem is wrong to explain their reasoning. Have students work in a small, teacher-led group to solve the problems. Guide students to record the checklist in their journal and create corresponding visuals to help them understand the process. Have students explain the process in their home language or using gestures, words. and phrases in English. 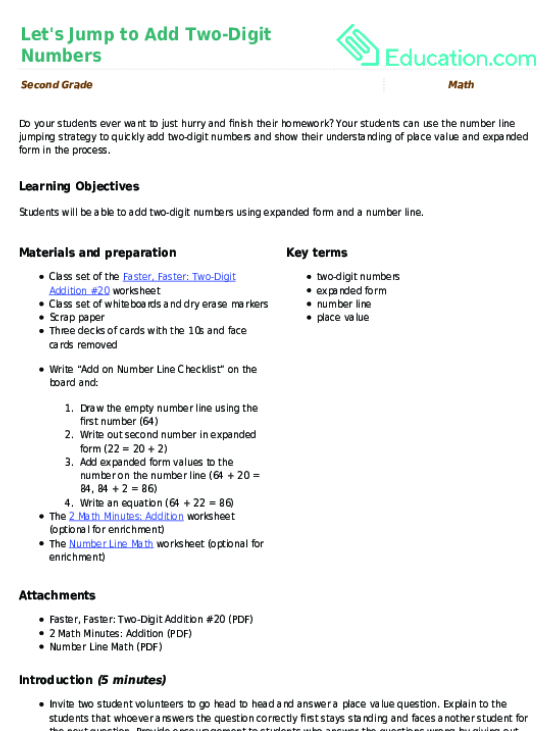 Provide students with a small, laminated number line and a whiteboard marker to use for step one. 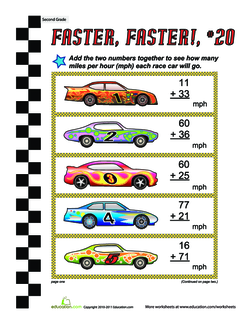 Pass out a copy of the Faster, Faster: Two-Digit Addition #20 worksheet to each student. Remind students to continue to refer to the Add on Number Line Checklist as they work through the problems. Explain the directions and pass out additional scrap paper for students to draw the number lines. Allow students to work in small groups with students who speak the same home language, if possible. Encourage students to use their notecards and the checklist with corresponding visuals in their journal for support. Ask students to explain what they need to do in their own words prior to starting the activity. Break down expanded form to word form. For example, instead of 98 = 90 + 8, use 98 = 9 tens + 8 ones. Draw and label the number line for struggling students. Challenge students to draw the number lines themselves when they show understanding through reteaching. 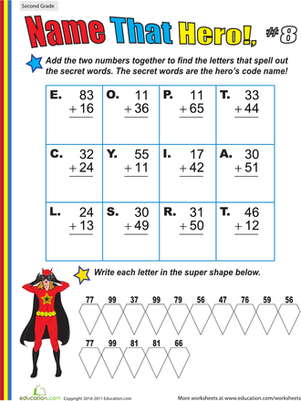 Use two-digit numbers that have no carrying involved (eg. 25 + 23, 51 + 32). 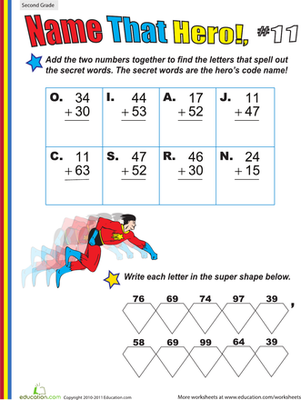 Provide the 2 Math Minutes: Addition worksheet to challenge students to perform the operation with speed and accuracy. 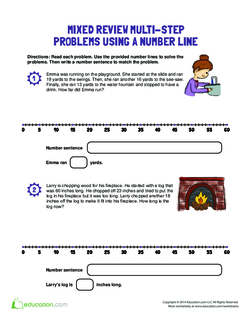 Elevate student thinking by challenging them to create their own equations from word problems using the Number Line Math worksheet. c. The total amount is ____. d. Write a complete equation. Collect exit tickets to serve as a formative assessment of student understanding. 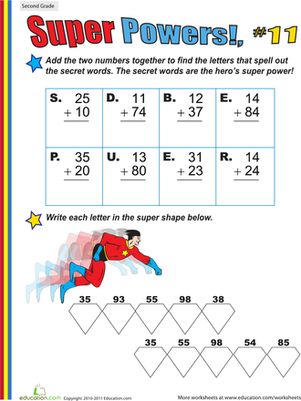 Evaluate two-digit addition understanding based on student responses on the Faster, Faster: Two-Digit Addition #20 worksheet and exit ticket. Create visuals next to the steps to support student understanding. Allow students to explain their answer to you. Review the student objective and ask students if they think they have met the objective. Require one or two students to defend their positions. Play the Counting by Twos video. Show another video and count by twos in students' home language, if possible. I think I understand how to add two-digit numbers using expanded form and a number line because____. Your students can use the number line jumping strategy to quickly add two-digit numbers and show their understanding of place value and expanded form in the process. 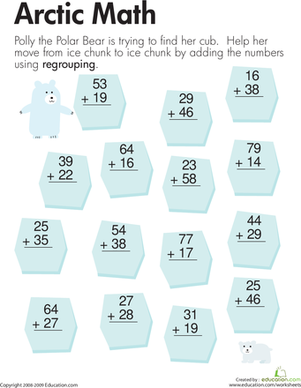 Give your students simple two-digit numbers to practice the decomposition addition strategy! 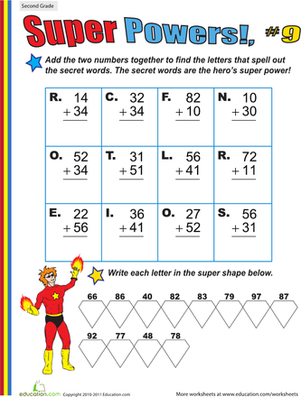 This fun worksheet is sure to motivate your second grader to practice two-digit addition, and it's great for mental math, too! 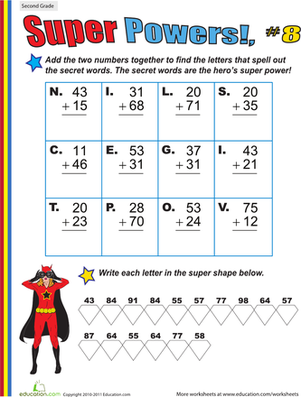 Solving these two-digit addition problems will lead your second grader to discovering the true name of this mystery super hero!